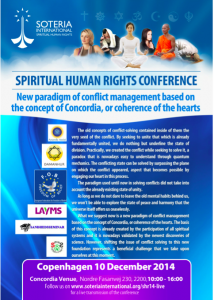 We invite you in the heart to participate to this process of finding coherent ways to solve the conflicts during the 7th Spiritual Human Rights conference. You can participate on Skype in order to put your questions or your comments. The conflicting state is the product of unilateral actions, lacking the horizon opened up by the understanding of other different viewpoints than our own. Nature itself is a permanent regaining of the state of harmony and balance, an action of permanent compensation of apparently conflicting forces. The universe provides us with the most eloquent example of transformation of conflicting forces into complementary forces, the difference between the two aspects being as big as that between death and life. Spiritual systems say in unison that there is a fundamental unity of the universal consciousness, a unique origin of everything that exists. The purpose of spirituality in general is to provide the path for regaining this universal, unifying factor, starting from the individual consciousness. The astonishing and also perfectly coherent diversity of the universe that opens up before the amazed eyes of modern man actually relies on this intrinsic unity of everything that exists. Everything that exists is deeply connected to this primordial unity with which it is in a reciprocity relation. The existence of this intrinsic unity makes it unnecessary to create the unification of viewpoints, and what is required is merely to connect our viewpoint to this universal unifying factor. In order to reach this state of primordial unity we have to become tangent in our inner being to the unifying factor, to the complete awakening of consciousness. When we ignore this unifying factor or when we don’t have confidence in the existence of this factor, we begin the individual action of uniting that which was already united, taking steps – without realizing it – towards the conflict that will inevitably appear later on. We can note the fact that the mind is always the one finding the differences, whereas the heart is the one that finds the unifying factor. That is why, in all spiritual systems of humanity, the heart is the “instrument” that puts us in contact with this unifying factor that exists in the background of even the most spectacular diversity. Modern studies have shown that when the state of harmony appears in the heart, those hearts that are in harmony of tone direct the brain activity towards finding a solution to the conflict. When the hearts are dissonant, the brain activity is oriented towards enhancing the differences, contrasts and towards pointing out the conflicting state. It is only due to habit that when confronted with a conflicting state we seek to extend the use of the mind to find solutions and, apparently paradoxically, the solutions that are found only generate more problems afterwards. However, in light of both spiritual teachings and scientific studies referring to the role of cardiac activity in harmonizing the being, the long-lasting solutions, integrated in the harmony and intrinsic unity of the universe in which we live emerge when we manage to harmonize communication from the heart. The old concepts of conflict-solving contained inside of them the very seed of the conflict. By seeking to unite that which is already fundamentally united, we do nothing but underline the state of division. Practically, we created the conflict while seeking to solve it, a paradox that is nowadays easy to understand through quantum mechanics. The conflicting state can be solved by surpassing the plane on which the conflict appeared, aspect that becomes possible by engaging our heart in this process. The paradigm used until now in solving conflicts did not take into account the already existing state of unity. As long as we do not dare to exit the old mental habits, we won’t be able to explore the state of peace and harmony that the universe itself offers us ceaselessly. 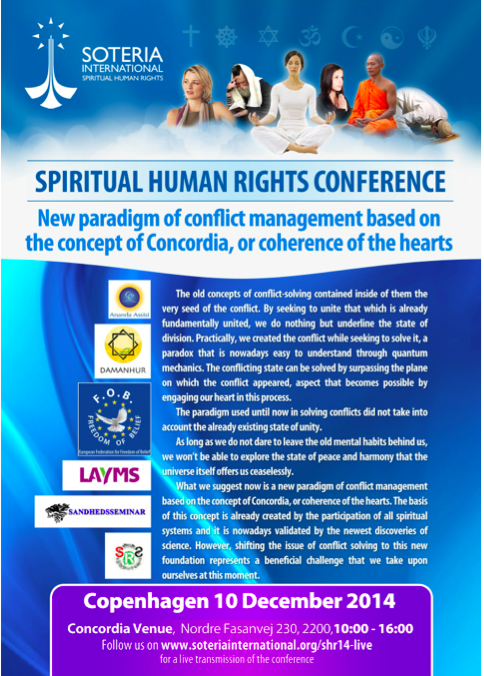 What we suggest now is a new paradigm of conflict management based on the concept of Concordia, or coherence of the hearts. The basis of this concept is already created by the participation of all spiritual systems and it is nowadays validated by the newest discoveries of science. However, shifting the issue of conflict solving to this new foundation represents a beneficial challenge that we take upon ourselves at this moment. The conflict can be solved by communion of the hearts and not by rearranging the same forces that have initially triggered the conflict. Einstein said that we cannot solve a problem on the same level on which it emerged in the first place. This is an integral perspective, coherent with all spiritual traditions and all frontiers of modern science alike, a perspective that can help us now when we need it the most. We invite you in the heart to participate to this process of finding coherent ways to solve the conflicts.